2016 Canadian Championships – Victoria, B.C. 2013 Canadian Championships – Belleville, ONT. 2012 Canadian Championships – Saskatoon, SASK. 2011 Canadian Championships – Blainville, QUE. 2010 Canadian Championships – Victoria, B.C. 2009 Canadian Championships – Aylmer, Ont. 2008 Canadian Championships – Calgary, Alb. 2007 Canadian Championships – Woodstock, Ont. 2006 Canadian Championships – Manitou Beach, Sask. 2005 Canadian Championships in Halifax, N.S. 2004 Canadian Championships in Victoria, B.C. 2003 Canadian Championships in Saint John, N.B. 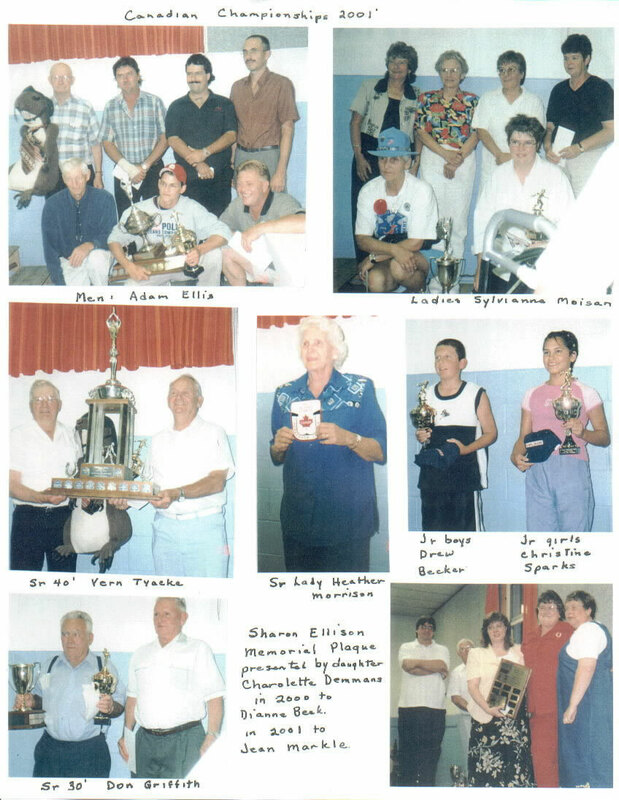 2001 Canadian Championships at the K-W Khaki (Wellesley, Ont) from Aug. 15-18. See the results, the game by game summaries, story and some pictures. Tom Hawkins was inducted into the Horseshoe Canada Hall of Fame in 2001. 2000 Canadian Championships – Manitou Beach, Sask. COMPLETE RESULTS! 1999 Canadian Championships – Waterloo, Quebec COMPLETE RESULTS! 1998 Canadian Championships – Victoria, B.C. COMPLETE RESULTS! 1997 Canadian Championships – Saint John, N.B. COMPLETE RESULTS! 1996 Canadian Championships results – Calgary, ALB. 1995 Canadian Championships results – Wellesley, ONT. 1994 Canadian Championships results – Victoria, B.C. 1993 Canadian Championships results – Stoney Creek, ONT. 1992 Canadian Championships results – Manitou Beach, Sask. 1991 Canadian Championships results – Trenton, ONT. 1990 Canadian Championships results – Portage La Prairie, MAN. 1989 Canadian Championships results – Halifax, N.S. 1988 Canadian Championships results – Calgary, Alb. 1987 Canadian Championships results – St-Hyacinthe, Que. 1986 Canadian Championships results – Burnaby, B.C. 1985 Canadian Championships results – Wellesley, Ont. 1984 Canadian Championships results – Regina, Sask. 1983 Canadian Championships results – Wellesley, Ont. 1982 Canadian Championships results – Victoria, B.C. 1981 Canadian Championships results – Victoriaville, Que. 1980 Canadian Championships results – Edmonton, Alb. 1979 Canadian Championships results – Ottawa, Ont. 1978 Canadian Championships results – Toronto, Ont. 1977 Canadian Championships results – Ladysmith, B.C..
1976 Canadian Championships results – Burnaby, B.C. 1975 Canadian Championships results – Burnaby, B.C. 1974 Canadian Championships results – Toronto, Ont. 1973 Canadian Championships results – Toronto, Ont. 1972 Canadian Championships results – Toronto, Ont. 1971 Canadian Championships results – Toronto, Ont. 1970 Canadian Championships results – Dauphin, Man. 1969 Canadian Championships results – Toronto, Ont. 1968 Canadian Championships results – Toronto, Ont. 1967 Canadian Championships results – Toronto, Ont. 1966 Canadian Championships results – Toronto, Ont. 1965 Canadian Championships results – Toronto, Ont. 1964 Canadian Championships results – Toronto, Ont. 1963 Canadian Championships results – Toronto, Ont. 1962 Canadian Championships results – Toronto, Ont. 1961 Canadian Championships results – Toronto, Ont. 1960 Canadian Championships results – Hamilton, Ont. 1959 Canadian Championships results – Toronto, Ont. 1958 Canadian Championships results – Toronto, Ont. 1957 Canadian Championships results – Toronto, Ont. 1956 Canadian Championships results – Toronto, Ont. 1955 Canadian Championships results – Toronto, Ont. 1954 Canadian Championships results – Toronto, Ont. 1953 Canadian Championships results – Toronto, Ont. 1952 Canadian Championships results – Toronto, Ont. 1951 Canadian Championships results – Toronto, Ont. 1950 Canadian Championships results – Toronto, Ont. 1949 Canadian Championships results – Toronto, Ont. 1938 Canadian Championships results – Toronto, Ont. 1937 Canadian Championships results – Toronto, Ont. 1936 Canadian Championships results – Toronto, Ont. 1934 Canadian Championships results – Toronto, Ont. 1933 Canadian Championships results – Toronto, Ont. 1932 Canadian Championships results – Toronto, Ont. 1931 Canadian Championships results – Toronto, Ont. 1930 Canadian Championships results – Toronto, Ont. 1929 Canadian Championships results – Toronto, Ont. 1928 Canadian Championships results – Toronto, Ont. 1927 Canadian Championships results – Toronto, Ont.